Epigenetic regulation of gene transcription plays a critical role in neural network development and in the etiology of Intellectual Disability (ID) and Autism Spectrum Disorder (ASD). However, little is known about the mechanisms by which epigenetic dysregulation leads to neural network defects. Kleefstra syndrome (KS), caused by mutation in the histone methyltransferase EHMT1, is a neurodevelopmental disorder with the clinical features of both ID and ASD. To study the impact of decreased EHMT1 function in human cells, we generated excitatory cortical neurons from induced pluripotent stem (iPS) cells derived from KS patients. In addition, we created an isogenic set by genetically editing healthy iPS cells. Characterization of the neurons at the single-cell and neuronal network level revealed consistent discriminative properties that distinguished EHMT1-mutant from wildtype neurons. Mutant neuronal networks exhibited network bursting with a reduced rate, longer duration, and increased temporal irregularity compared to control networks. We show that these changes were mediated by the upregulation of the NMDA receptor (NMDAR) subunit 1 and correlate with reduced deposition of the repressive H3K9me2 mark, the catalytic product of EHMT1, at the GRIN1 promoter. Furthermore, we show that EHMT1 deficiency in mice leads to similar neuronal network impairments and increased NMDAR function. Finally, we could rescue the KS patient-derived neuronal network phenotypes by pharmacological inhibition of NMDARs. Together, our results demonstrate a direct link between EHMT1 deficiency in human neurons and NMDAR hyperfunction, providing the basis for a more targeted therapeutic approach to treating KS. Advances in human genetics over the past decade have resulted in the identification of hundreds of genes associated with intellectual disability (ID) and autism spectrum disorder (ASD)1. Within this group of newly identified genes the number of chromatin regulators is remarkably high2–4. These regulators are engaged in genome-wide covalent DNA modifications, post-translational modifications of histones, and control of genomic architecture and accessibility5. Several ASD/ID-linked chromatin regulators directly interact with one another to form larger complexes, regulating chromatin structure to control the expression of genes important for neurodevelopment and/or neuroplasticity3. Despite considerable progress in elucidating the genetic architecture of many neurodevelopmental disorders (NDDs), a large gap still exists between the genetic findings and deciphering the cellular or molecular pathobiology6. In particular, we require a better understanding of the relevance of genetic changes with respect to their downstream functional consequences and whether there is overlap between different patients within the clinical spectrum6. Kleefstra syndrome (KS) (OMIM#610253) is an example of a rare monogenic NDD with ID, ASD, hypotonia and dysmorphic features as hallmark phenotypes7–9. KS is caused by heterozygous de novo loss-of-function mutations in the EHMT1 gene (Euchromatin Histone Lysine Methyltransferase 1, also known as GLP) or by small 9q34 deletions harboring (part of) the gene7. In a complex with EHMT2 (also known as G9a), EHMT1 methylates histone 3 at lysine 9 (H3K9me1 and H3K9me2), promoting heterochromatin formation and leading to gene repression10. Constitutive and conditional loss of EHMT1 function in mice and Drosophila leads to learning and memory impairments11–13. Additionally, Ehmt1+/− mice recapitulate the developmental delay and autistic-like behaviors that are observed in KS patients14,15. At the cellular level, these mice show a significant reduction in dendritic arborization and the number of mature spines in CA1 pyramidal neurons11. The dynamic regulation of H3K9me2 by EHMT1/2 is also involved in synaptic plasticity and learning and memory16–18. For instance, EHMT1 and 2 are required for synaptic scaling, a specific form of homeostatic plasticity, by regulating the expression of brain-derived neurotrophic factor (BDNF)16. Yet it remains unknown how deficits caused by loss of EHMT1 mechanistically affect the development of human neuronal networks. Human induced pluripotent stem (iPS) cell technology19 enables us to the study the specific role of individual cell types in developing neural circuits. By using patient-derived neurons, we can examine the early pathophysiology of NDDs in the context of each patient’s genetic background. Neuronal and synaptic maturation can be monitored using single-cell and neuronal network electrophysiological recordings, allowing recapitulation of disease progression20,21. Here, we generated iPS cell lines from three patients with different EHMT1 loss-of-function mutations, including one line from the parent of an affected child with KS due to a germline mutation. The parent carried the same mutation but as a mosaicism, which gave us a unique biologically occurring isogenic control. Through in-depth characterization at the single-cell and neuronal network level, we uncovered a robust and defined phenotype that was consistent across all patient lines and was also observed in neurons with CRISPR-engineered disruption of EHMT1. At the molecular and cellular level, we show that the electrophysiological phenotype in patient neurons is mediated by upregulation of NMDA receptor (NMDAR) subunit 1, which we also found in Ehmt1+/− mice. We conclude by showing that pharmacological inhibition of NMDARs rescues the KS-associated network phenotypes. 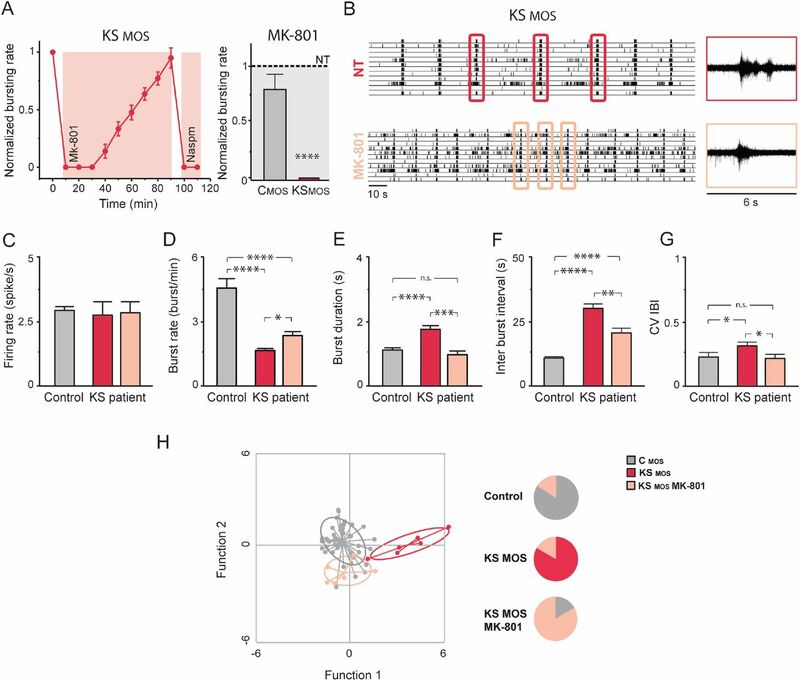 Therefore, our findings establish a direct link between EHMT1 deficiency in human neurons and NMDAR hyperfunction, providing new insights into the pathophysiology of KS. We generated several iPS cell lines, including from two patients with KS and two healthy subjects (respectively KS1, KS2 and C1, C2) (Fig. 1A and Supplementary Fig. S1, Material and Methods). One patient (KS1) had a frameshift mutation in EHMT1 leading to a premature stop codon (p.Tyr1061fs, patient 25 in22), while the other patient had a missense mutation in the Pre-SET domain (p.Cys1042Tyr, patient 20 in8), predicted to disrupt the conformation of this domain. As expected for a frameshift mutation (due to nonsense-mediated RNA decay), Western blot and realtime quantitative PCR (RT-qPCR) analyses revealed a 50% reduction of EHMT1 expression in KS1 (P<0.0001), while KS2 showed normal EHMT1 expression levels (P>0.9999) (Fig. 1B and Supplementary Fig. S2A). In addition to these lines, iPS cells were generated from a parent who had an affected child with KS due to a microdeletion on chromosome 9q34 (233 kb) including EHMT1 that appeared present as a mosaic in the parent23. From this same patient, we selected an iPS clone harboring the KS-causing mutation (KSMOS) as well as a control clone not carrying the EHMT1 deletion (CMOS) (Fig. 1A and Supplementary Fig. S1, S2). This isogenic pair shares the same genetic background except for the KS-causing mutation, thereby reducing variability and enabling us to directly link phenotypes to heterozygous loss of EHMT1. Western blot analysis and RT-qPCR analysis showed a 40% reduction of EHMT1 expression in KSMOS compared to CMOS (P=0.006) (Fig. 1B and Supplementary Fig. S2A). All selected clones showed positive expression of pluripotency markers (OCT4, TRA-1-81, NANOG and SSEA4) and single nucleotide polymorphism (SNP) arrays were performed to confirm genetic integrity (Supplementary Fig. S1, Material and Methods). A) KS and control iPS lines used in this study B) Western blot and quantification of EHMT1 protein levels in iPS cells, n=6-7 for each condition. C) Schematic presentation of the differentiation protocol, including representative images of control iNeurons immunostained for MAP2 during development (scale bar 10 μm). D) Representative somatodendritic reconstructions of control- and KS iNeurons (scale bar 50 μm). E) Representative images of control- and KS iNeurons stained for MAP2 (red) and synapsin 1/2 (green) at DIV 21 (scale bar 5 μm) and quantification of synapsin puncta, n=25 for C1; n=13 for C2; n=15 for CMOS; n=17 for KS1; n=11 for KS2; n=15 for KSMOS. F) Representative example traces of mEPSCs from control- and KS iNeurons at DIV 21. Quantification of the frequency and amplitude of mEPSCs in control (C1 and CMOS) and KS (KS1 and KSMOS) iNeurons (i.e. pooled value for control and KS iNeurons), n=22 for C, n=21 for KS. Data represent means ± SEM. ** P<0.005, *** P<0.0005, **** P<0.0001, one-way ANOVA test and post hoc Bonferroni correction was performed between controls and KS iNeurons and Mann-Whitney test was performed between two groups. We differentiated iPS cells into a homogeneous population of excitatory upper layer cortical neurons (iNeurons) by forced expression of the transcription factor transgene Ngn224. For all experiments, iNeurons were co-cultured with freshly isolated rodent astrocytes25 to facilitate neuronal and network maturation (Fig. 1C). All iPS cells (control and KS) were able to differentiate into MAP2-positive neurons at the same efficiency (Supplementary Fig. S2C, D). Similar to iPS cells, EHMT1 expression was reduced in neurons derived from KS1 (P=0.001) and KSMOS (P=0.0091), but not KS2 (P=0.1446) (Supplementary Fig. S2B) compared to controls. However, all KS iNeurons showed reduced H3K9me2 immunoreactivity, indicative of EHMT1 haploinsufficiency (P<0.0001 for KS1 and KS2; P=0.0001 for KSMOS) (Supplementary Fig. S2E). Twenty-one days after the start of differentiation (days in vitro, DIV), both control and KS iNeurons showed mature neuronal morphology. We measured this by reconstruction and quantitative morphometry of DsRed-labeled iNeurons at DIV 21. We observed no significant differences between control and KS iNeurons in any aspect of neuronal somatodendritic morphology, including the number of primary dendrites, dendritic length and overall complexity (Fig. 1D and Supplementary Fig. S3A-H). ID and ASD have been associated with synaptic deficits in rodents and humans21,26. We therefore investigated whether EHMT1-deficiency leads to impairments in synapse formation. To this end, we stained control and KS iNeurons for pre- and post-synaptic markers (i.e. synapsin and PSD95, respectively) at DIV 21. We observed that putative functional synapses were formed on control as well as KS iNeurons (i.e., synapsin always co-localized with PSD95, Supplementary Fig. S3I), without any indications for differences in the number of synaptic puncta between the different iPS cell lines (Fig. 1E). Furthermore, whole-cell patch-clamp recordings at DIV 21 of iNeurons grown at similar densities and in the presence of tetrodotoxin (TTX) also revealed no differences in the frequency or amplitude of AMPA receptor (AMPAR)-mediated miniature excitatory postsynaptic currents (mEPSCs). This indicates that KS iNeurons are generally not impaired in the AMPAR component of the excitatory input they receive (Fig. 1F and Supplementary Fig. S3J). At DIV 21 nearly 90% of the control and KS patient iNeurons fired multiple action potentials, indicative of a mature state of their electrophysiological properties (Supplementary Fig. S3K). When recording intrinsic passive and active properties from control and KS patient iNeurons at DIV 21, we found no differences between the lines (Supplementary Fig. S3L-O). Collectively, our data thus indicate that there were no significant differences between control and KS patient iNeurons with regard to neuronal morphology, excitatory synapses and intrinsic properties. Dysfunction in neuronal network dynamics has been observed in the brain of patients with psychiatric and neurological conditions27. In addition, neuronal network dysfunction has been identified in model systems for several ID/ASD syndromes20,28. Therefore, despite the normal properties of KS iNeurons on single cell level, we hypothesized that impairments during brain development caused by loss of EHMT1 would be reflected on a higher level, i.e. at the network level. To test this hypothesis we examined and compared the spontaneous electrophysiological population activity of neuronal networks derived from controls and KS patients growing on microelectrode arrays (MEAs) (Fig. 2A). MEAs allow us to non-invasively and repeatedly monitor neuronal network activity through extracellular electrodes located at spatially-separated points across the cultures. Fig. 2. Spontaneous electrophysiological activity of control- and KS patient-derived neuronal networks. A) Representative image of a control-derived neuronal network on MEAs stained for MAP2 (red) and PAN Axon (green). B) Representative raster plot of electrophysiological activity exhibited by control-derived neuronal network at different time points during development. C-F) Quantification of network properties as indicated. G-H) Raster plot of spontaneous electrophysiological activity exhibited by G) control and H) KS networks at DIV 28. 6 s of raw data showing a burst recorded from a representative channel are shown for each iPS line. I-L) Quantification of network parameters as indicated I. M-N) Histogram showing the distribution of M) the network burst duration (bin size=100 ms) and N) the network inter burst interval (bin size=1 s). O) Quantification of percentage of spike outside network burst and P) Quantification of coefficient of variability of the inter-burst interval. n=23 for C1; n=10 for C2; n=10 for CMOS; n=15 for KS1; n=15 for KS2; n=12 for KSMOS. Data represent means ± SEM. * P<0.05, ** P<0.005, **** P<0.0001, one-way ANOVA test and post hoc Bonferroni correction was performed between controls and KS patient-derived cultures and Mann-Whitney test was performed between two groups. First, we monitored the in vitro development of control neuronal networks by recording the MEAs in intervals of 1 week. We found that for control iNeuron networks the pattern of activity changed progressively over a period of several weeks (Fig. 2B-F), similar to what we have observed previously in rodent neuronal cultures29. In particular, during the first three weeks of differentiation, the control iNeurons mainly showed sporadic action potentials or “spiking” activity (Fig. 2B-F, DIV 17), indicating they were immature and not yet integrated in a network. By the fourth week in vitro, electrical activity was organized into rhythmic synchronous events (network burst), composed of many spikes occurring close in time and across all electrodes (Fig. 2B-F, DIV 24). This indicates that the iNeurons had self-organized into a synaptically-connected, spontaneously active network. Both the firing rate, which is a general measure of total activity across the entire network, and network burst activity increased as the cultures developed but plateaued by DIV 28 (Fig. 2C, D). After this time point, the neuronal network activity remained stable (Fig. 2C-F). Of note, we observed no difference in the overall level or pattern of activity between the C1, C2 and CMOS control lines at DIV 28 (Fig. 2G, I-L). The highly reproducible network characteristics observed across all controls therefore provided us with a consistent and robust standard to which we could directly compare KS-patient derived neuronal networks. Next, we characterized the neuronal networks derived from KS patients. Similar to controls, network burst activity appeared by the fourth week in vitro (see raster plots in Fig. 2H). The global level of activity in all of KS networks was similar to controls (i.e. the firing rate, Fig. 2I, P=0.073), indicating similar spiking frequencies between control and KS iNeurons. However, we found that the network bursts occurred at a lower frequency and with longer duration (P<0.0001 for both parameters) (Fig. 2J, K, M and Supplementary Fig. S4A, B). Additionally, as a consequence of the lower network burst frequency, the inter-burst interval was longer compared to controls (Fig. 2L, N and Supplementary Fig. S4C, D; P<0.0001). We also observed that spike organization differed from controls, which was indicated by the smaller percentage of spikes occurring outside the network bursts (P=0.0077) (Fig. 2O). A final aspect is that, in comparison, the KS networks also exhibited an irregular network-bursting pattern, illustrated by the statistically larger coefficient of variation (CV) of the inter-burst interval (P<0.0001) (Fig. 2P). Interestingly, the increased burst duration phenotype observed at the network level was also present at the single-cell level (Supplementary Fig. S3P). 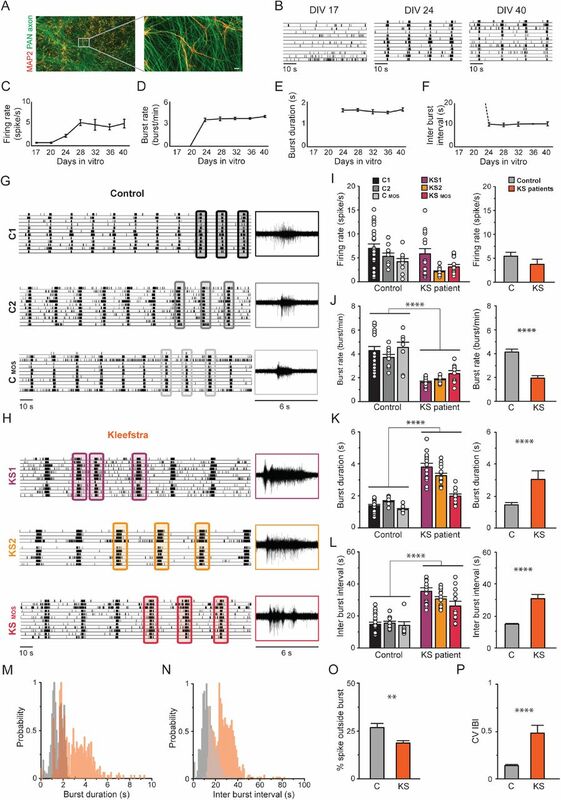 Indeed, whole-cell voltage-clamp recordings of spontaneous excitatory postsynaptic currents (sEPSCs), show that the activity received by KS-derived neurons was composed by bursts with durations longer than in control. Taken together, our data show that KS neuronal networks consist of fewer and irregular network bursts, and the bursts themselves were longer in duration when compared to control networks. To further address whether heterozygous loss of EHMT1 is necessary and/or sufficient for the observed KS patient-derived network phenotypes, we expanded our analysis and generated a second set of isogenic human iPS cells. We made use of CRISPR/Cas9 gene editing technology to generate an isogenic control and EHMT1 mutant iPS cell line with a premature stop codon in exon 2 (CCRISPR and KSCRISPR, Fig. 3A and Supplementary Fig. S5F, G). Western blot and RT-qPCR analysis revealed that EHMT1 expression was significantly (by more that 50%) reduced in KSCRISPR iPS (P=0.0079 for western blot; P=0.0054 for q-PCR) and iNeurons (P=0.0018) compared to CCRISPR (Fig. 3B, E and Supplementary Fig. S5F, G). Both, CCRISPR and KSCRISPR iPS cells differentiated equally well to iNeurons (Supplementary Fig. S5H, I). Furthermore, KSCRISPR iNeurons showed reduced H3K9me2 immunoreactivity compared to CCRISPR iNeurons (Supplementary Fig. S5J). We observed no differences in the formation of functional synapses, based on immunocytochemistry, between CCRISPR and KSCRISPR, corroborating our results with the other KS cell lines (P=0.7938) (Fig. 3C, F). At the network level, CCRISPR showed patterns of spiking and network burst activity by the fourth week, similar to control networks (Fig. 3D, G-K). Fig. 3. Spontaneous electrophysiological activity of neuronal network derived from control- and CRISPR/Cas9-edited iPS cells. A) Isogenic line: CCRISPR and KSCRISPR. B) Western blot showing the EHMT1 protein levels in iPS cells. C) Representative images of iNeurons stained for MAP2 (red) and synapsin 1/2 (green) at DIV 21 (scale bar 5 μm). D) Representative raster plots showing spontaneous activity exhibited by CCRISPR and KSCRISPR at DIV 28 on MEAs. 6 s of raw data showing a burst recorded from a representative channel are shown. E) Quantification of relative EHMT1 expression, n=5. F) quantification of synapsin puncta in CCRISPR and KSCRISPR iNeurons, n=9 for CCRISPR; n=13 for KSCRISPR. G-K) Quantification of network parameters as indicated, n=7 for CCRISPR; n=12 for CCRISPR. Data represent means ± SEM. * P<0.05, ** P<0.005, *** P<0.0005, **** P<0.0001, one-way ANOVA test and post hoc Bonferroni correction was performed between controls and KS networks and Mann-Whitney test was performed between two groups. In contrast to this, the KSCRISPR networks exhibited a phenotype similar to the other KS patient networks, where network bursts occurred at a lower frequency (P<0.0001), longer duration (P=0.0159) and in an irregular pattern (P=0.0346) compared to its isogenic control. These results, from two different isogenic iPS cell lines, including the iPS cells derived from the parent with a mosaic mutation (CMOS and KSMOS), establish a causal role for EHMT1 in the observed neuronal network phenotypes. Our in vitro experiments showed that EHMT1 deficiency causes a reproducible and identifiable neuronal network phenotype. As we observed only non-significant iPS cell line-specific variability in the functional network properties of, both, the control and KS groups, the multiple descriptive parameters we extracted from the raw MEA recordings clearly delineated control from KS networks. Indeed, we confirmed this in an unbiased discriminant analysis of network parameters, control and KS networks clearly clustered away from each other. This separation was not observed when the analysis was performed on single-cell parameters (i.e. morphology and intrinsic properties, Supplementary Fig. S6A-F). From a mechanistic perspective, our direct comparison of iNeurons derived from iPS cells with a frameshift, missense or deletion in EHMT1 showed that the phenotype is due to aberrant EHMT1 enzymatic activity rather than the disrupted protein. The activity and phenotype in these networks ultimately depend on many factors, such as ion channel and receptor expression, the number of functional synapses, and membrane electrical properties. We next sought to uncover the contributing molecular pathways downstream of EHMT1, underlying the KS network phenotype. We observed that KS patient-derived neuronal networks showed an aberrant pattern of activity, mainly characterized by network bursts with longer durations compared to controls. Previous studies on rodent-derived neuronal networks have shown that burst duration is directly influenced by AMPARs and NMDA receptors (NMDARs). Specifically, previous reports used receptor-type specific antagonists to show that AMPAR-driven bursts have short durations while NMDAR-driven bursts have comparatively longer durations30. We therefore hypothesized that increased NMDAR activity contributed to the lengthened bursts seen in KS networks. To test this, we pharmacologically blocked either AMPARs or NMDARs and compared the effect on control and KS neuronal network activity at DIV 28. In accordance with previous work30,31, we found in our control networks that acute treatment with an AMPAR antagonist (NBQX, 50 μM) abolished all network burst activity, whereas inhibiting NMDARs (D-AP5, 60 μM) only slightly decreased the network burst activity (Fig. 4A, C). These results indicated that, in control neurons, network burst activity is mainly mediated by AMPARs. In particular, we found it to be mediated by GluA2-containing AMPARs, since the network bursts were not blocked with Naspm (10 μM), an antagonist that selectively blocks GluA2-lacking AMPARs (Supplementary Fig. S7B, pre-D-AP5). Fig. 4. Effect of AMPA-versus NMDA-receptor blockade on control and KS patient-derived neuronal network activity. A-B) Representative raster plots showing 3 min of spontaneous activity from A) control (CMOS) and B) KS (KSMOS) neuronal networks grown on MEAs at DIV 28. Where indicated, the cells were either non-treated (NT) or treated with 50 μM NBQX to block AMPA receptors or 60 μM D-AP5 to block NMDA receptors. C-D) Bar graphs showing the effect of NBQX and D-AP5 on the network burst rate for C) control and D) KS neuronal networks (CMOS and KSMOS respectively). The values are normalized to the NT data (n=6 for CMOS and n=6 for KSMOS in all conditions). E) The effect of a 1-hour D-AP5 treatment on CMOS and KSMOS neuronal network activity. After 1 hour, the calcium-permeable AMPA receptor blocker Naspm (10 μM) or NBQX were added. Data represent means ± SEM. ** P<0.005, *** P<0.0005, n=8 for CMOS and n=9 for KSMOS, one-way ANOVA test followed by a post hoc Bonferroni correction was performed between conditions. Similar to controls, we found that in KS networks NBQX completely abolished network burst activity (Fig. 4B, D). However, in stark contrast to controls, D-AP5 robustly suppressed the bursting activity in all of our KS patient lines (Fig. 4B, D and Supplementary Fig. S7A), indicating that it was a common feature and a direct consequence of EHMT1-deficiency. Interestingly, the suppression of network burst activity by D-AP5 in KS networks was transient. Network burst activity showed ~50% recovery after 30 min and had returned to baseline (i.e. pre-D-AP5 levels) after 24 hours (Fig. 4E and Supplementary Fig. S7C). The early stages of homeostatic plasticity, specifically synaptic upscaling, are initiated by global neuronal inactivity and characterized by insertion of GluA2-lacking (i.e. Ca2+-permeable AMPARs, CP-AMPARs) into the synapse to restore activity32. Therefore, to determine the nature of the recovery, we first blocked KS networks with D-AP5, and added Naspm after 1 hour. After 1 hour, Naspm completely blocked the reinstated network bursting activity, indicating the recovery in KS networks was due to synaptic insertion of GluA2-lacking AMPARs (Fig. 4E and Supplementary Fig. S7B). Of note, although in control networks burst activity was not suppressed by D-AP5, we did observe that Naspm had a small but significant effect on the burst rate. This indicates that NMDAR blockage in controls also induced synaptic insertion of GluA2-lacking AMPARs, albeit less pronounced than in KS networks. After 24 hours, the network activity in KS networks was again completely suppressed with NBQX but only partially with Naspm, suggesting that GluA2-lacking AMPARs were actively exchanged with GluA2-containing AMPARs (Supplementary Fig. S7C). Collectively, our results demonstrate that NMDAR inhibition with D-AP5 induces synaptic plasticity in KS networks, allowing reinstating network burst activity through the incorporation of GluA2-lacking AMPARs, which later on are replaced by GluA2-containing AMPARs. Intrigued by these findings, we sought an alternative way to block network bursting independent of directly antagonizing AMPARs and NMDARs. The classic method for inducing synaptic upscaling, by preventing action potentials with the sodium channel blocker TTX33, would necessarily prevent observation of the early stages of the dynamic recovery on MEAs. 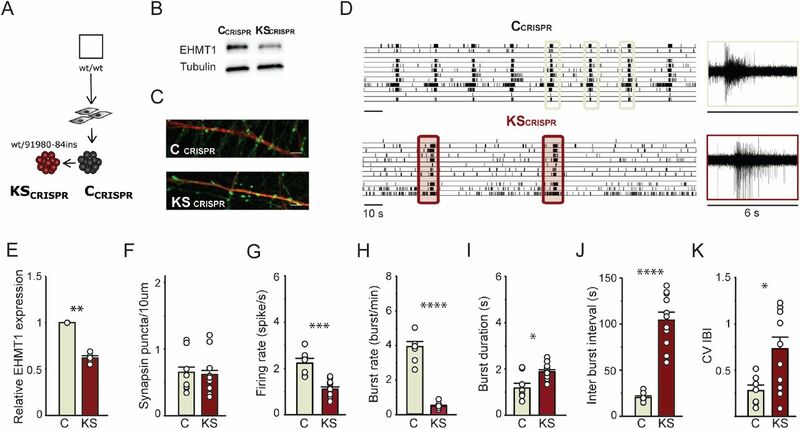 To circumvent this issue, we used the anti-epileptic drug Retigabine, which is a voltage-gated K+-channel (Kv7) activator that effectively hyperpolarizes the resting membrane potential in neurons34. We reasoned that Retigabine would have the combined effect of acutely hampering neurons in reaching action potential threshold while leaving the voltage-gated Na+ channels unaffected. Thus, while simultaneously strengthening the Mg2+ block on NMDARs we could still observe any (re)occurring network activity on the MEA. Indeed, when we applied Retigabine (10 μM) to the networks, they were temporarily silenced, with no discernible spiking or bursting activity. Within 100 min, there was again a Naspm-sensitive recovery mediated by GluA2-lacking AMPARs, but this time it occurred in both the control and KS networks and the pattern in both was identical (Supplementary Fig. S7D). This reinforced the notion that the electrophysiological differences we saw earlier between control and KS networks are a direct consequence of NMDAR activity in the KS iNeurons. Furthermore, we found that Retigabine treatment in KS networks decreased the burst length (P=0.012) (Supplementary Fig. S7E), suggesting that Retigabine-induced plasticity allowed KS networks to switch from an NMDAR-dependent bursting to AMPAR-driven bursting, similar to controls. The results from our pharmacological experiments suggested that NMDAR expression might be increased in KS iNeurons relative to controls. To test this hypothesis, we measured the transcripts of the most common NMDAR and AMPAR subunits by RT-qPCR on total mRNA isolated from CMOS and KSMOS iNeurons (Fig. 5A). We were intrigued to find a 4-fold upregulation of GRIN1 mRNA, which encodes NMDAR subunit 1 (NR1), the mandatory subunit present in functional NMDARs (P<0.0001). We found no significant changes in any other NMDAR (GRIN2A and GRIN2B) or AMPAR (GRIA1, GRIA2, GRIA3 and GRIA4) subunits that we analyzed. We further corroborated these results with Western blot analysis which revealed significantly increased NR1 expression in lysates from KSMOS iNeurons compared to CMOS iNeurons (P=0.074) (Fig. 5B). Our previous functional data indicated that the reduction in methyltransferase activity of EHMT1 was directly responsible for the phenotypes we observed at the network level. Therefore, we investigated whether the increased GRIN1 expression correlated with reduced H3K9me2, the repressive mark mediated by EHMT1, at the GRIN1 promoter. To examine the levels of H3K9me2, we performed chromatin immunoprecipitation qPCR (ChIP-qPCR). We found that in KSMOS iNeurons H3K9me2 occupancy was reduced at the GRIN1 promoter (P=0.0148), but not at the promoter of the housekeeping gene PPIA (P=0.5337) (Fig. 5C). In accordance with our previous study in Ehmt1+/− mice16, we also found that the occupancy at the BDNF promoter was reduced in KSMOS iNeurons (P=0.0314) (Fig. 5C). Taken together, our data show that NR1 is upregulated in KS neuronal networks due to an aberrant regulation. Specifically, the loss of EHMT1 activity results in a reduction of the repressive H3K9me2 mark, resulting in an upregulation of NR1 and explaining the neuronal network phenotype we observed on the MEAs. Fig. 5. 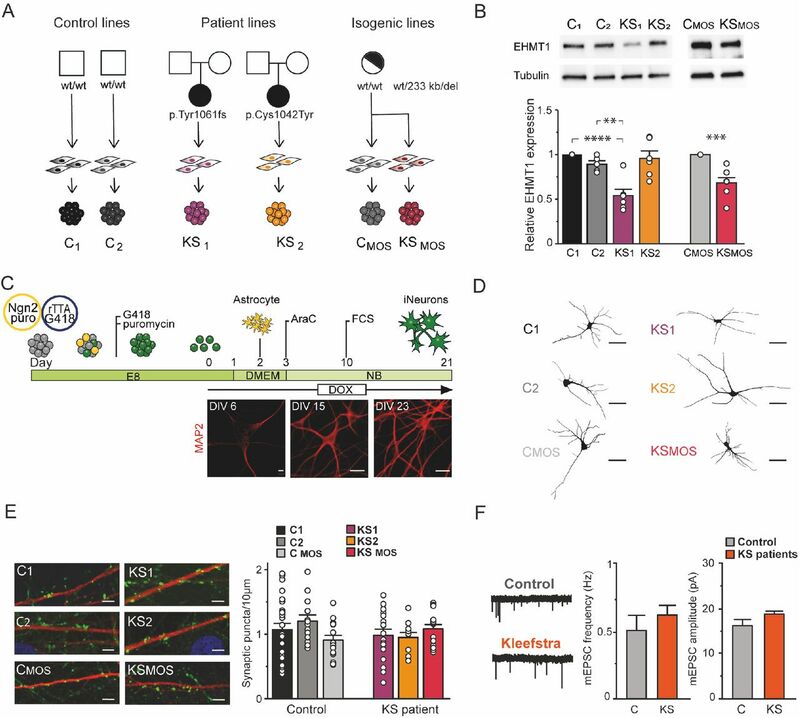 NMDA receptor subunit 1 is upregulated in KS patient-derived neurons. A) Bar graph showing relative GRIA1, GRIA2, GRIA3, GRIA4, GRIN1, GRIN2A and GRIN2B mRNA expression in control and KS iNeurons at DIV 28. KSMOS mRNA expression is normalized to CMOS (n=3). B) Representative western blots and graph showing the NR1 protein levels in control and KS iNeurons at DIV 28. Values of KSMOS are normalized to CMOS (n=3). C) ChIP assay of H3K9me2 followed by promoter-specific (BDNF_pr4, GRIN1_pr2, and PPIA_pr2) qPCR performed in iNeurons from CMOS and KSMOS (n=4). Data represent means ± SEM. * P<0.05, ** P<0.005, *** P<0.0005, one-way ANOVA test and post hoc Bonferroni correction was performed between conditions. Having established that EHMT1-deficiency alters neuronal network activity due to an aberrant upregulation of NR1 in KS iNeurons, we next set out to measure neuronal network activity in Ehmt1+/− mice, a validated mouse model that recapitulates the core features of KS14,15. Similar to what we found in iNeurons, primary cultures of cortical neuronal networks derived from Ehmt1+/− mice showed network bursts with lower frequency (P=0.002) and longer duration (P=0.045) compared to cultures from littermate controls, whereas the mean firing rate was unaltered (P=0.297) (Fig. 6A). Using whole-cell voltage clamp recordings in acute brain slices from WT and Ehmt1+/− mice, we measured the ratio between AMPAR- and NMDAR-mediated currents from cortical Layer 4 to Layers 2/3 synapses. We found that the NMDAR/AMPAR ratio was significantly increased in cortical networks of Ehmt1+/− mice as compared to WT littermates (P=0.02) (Fig. 6B). We found no changes in the kinetics of NMDAR-mediated currents, suggesting that there is no difference in the expression of NMDAR subunits 2A or 2B between cortical networks of WT and Ehmt1+/− mice (Supplementary Fig. 6B)35. Because an increased NMDAR/AMPAR ratio can be caused by an upregulation of NMDARs, downregulation of AMPARs, or both, we measured AMPAR-mediated mEPSCs in Layers 2/3. We found no changes in the frequency (P=0.8441) or amplitude (P=0.5774) of AMPAR-mediated mEPSCs suggesting that the increased NMDAR/AMPAR ratio in Ehmt1+/− mice is due to increased NMDAR activity (Fig. 6C). Fig. 6. Neuronal network activity and NMDAR/AMPAR ratio in Ehmt1+/− mice. A) Representative raster plot showing 2 min of recording of the activity exhibited by cultured primary neurons derived from Ehmt1+/+ and Ehmt1+/− mice grown on MEAs at DIV 20. Three network burst are highlighted for each raster. Graph showing the firing rate, network bursting rate and network burst duration of cultures from Ehmt1+/+ and Ehmt1+/− mice (grey and orange bar respectively) on MEA at DIV 28. n=8 for Ehmt1+/+ and n=6 for Ehmt1+/−. Values from Ehmt1+/− are normalized to Ehmt1+/+ B) NMDAR/AMPAR ratio and decay constant (i.e. Tau) in cortical slices (layer 2/3 auditory cortex) from Ehmt1+/+ and Ehmt1+/− mice at P21. n=6 for Ehmt1+/+ and n=8 for Ehmt1+/−. C) Representative example traces of miniature excitatory postsynaptic currents (mEPSCs) excitatory events recorded from layer 2/3 from Ehmt1+/+ and Ehmt1+/− mice. Graph showing quantification of the frequency and amplitude of mEPSCs of Ehmt1+/+ and Ehmt1+/− mice. n=8 for Ehmt1+/+ and n=8 for Ehmt1+/−. Data represent means ± SEM. * P<0.05, **** P<0.0001, Mann-Whitney test was performed between two groups. Our previous experiments showed that by inhibiting NMDARs in KS networks for 24 hours, we could shift the balance so that neuronal networks were progressively driven by GluA2-containing AMPARs, similar to controls (Supplementary Fig. S7C). Based on these results, we reasoned that the phenotypes in KS networks could be rescued by chronically inhibiting NMDARs in mature neuronal networks (i.e. DIV 28). D-AP5, however, is a competitive antagonist that occupies the glutamate-binding site on NMDARs. Instead, we chose to potently block the channel pore of NMDARs, thereby primarily inhibiting postsynaptic calcium flux, with the selective, noncompetitive open-channel blocker MK-80136. The immediate effects of MK-801 (1 μM) on KS network activity were similar to D-AP5, where network bursting was transiently suppressed and then recovered by insertion of GluA2-lacking AMPARs, which were again completely inhibited by Naspm (Fig. 7A). Next, we treated CMOS and KSMOS networks beginning at DIV 28 for 7 days with MK-801. We found that chronically blocking NMDARs in KSMOS networks with MK-801 reversed the major network parameters that we measured in KSMOS iNeurons, bringing them closer to controls (Fig. 7B-G). More specifically, we observed an increased burst frequency (P=0.0265) (Fig. 7D), with a parallel reduction in the inter-burst interval (P=0.0013) (Fig. 7F). Furthermore, the network burst duration was reduced (P=0.0002) (Fig. 7E) and the network bursting became more regular (P=0.0219) (Fig. 7G) showing values similar to control (P>0.9999 for both parameters), indicative of a shift towards AMPAR-driven networks. A discriminant analysis based on the aforementioned parameters conclusively showed that the KSMOS networks treated with MK-801 for 7 days became segregated from untreated KSMOS networks and became more overlapping with CMOS networks (Fig. 7H). 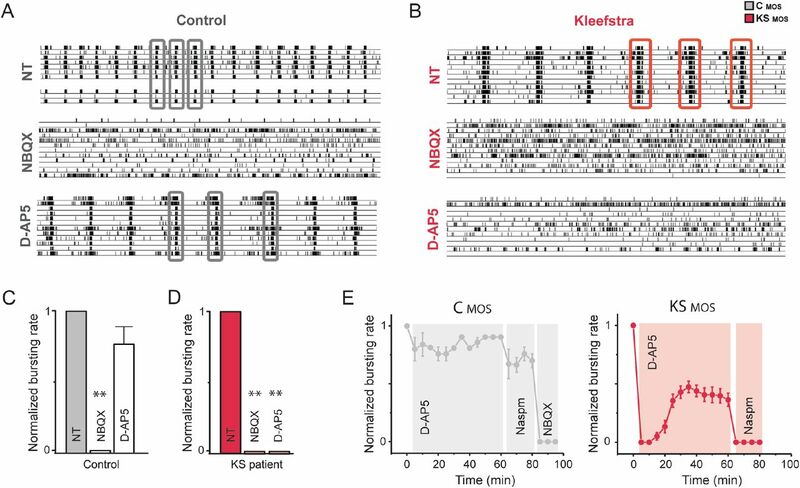 These results indicate that the aberrant pattern of activity exhibited by KS patient-derived neuronal networks can be rescued by specifically inhibiting NMDAR activity. Fig. 7. NMDAR antagonist MK-801 rescues KS network phenotypes. A) MK-801 (1 μM) effect on KSMOS neuronal network activity (DIV 28). After 90 min, Naspm was added. Graph showing the effect of MK-801 (1 μM) treatment on the neuronal network burst frequency for CMOS and KSMOS derived neuronal network 20 min after application. The values are normalized to the non-treated (NT) condition. B) Representative raster plot showing the activity exhibited by KS patient-derived neuronal network (KSMOS) grown on MEAs either non-treated or after one week of treatment with MK-801. 6 s of raw data showing a burst recorded from a representative channel are shown for the NT and the treated conditions. C-G) Quantification of network properties as indicated, n=8 for CMOS; n=6 for KSMOS and n=6 for KSMOS treated with MK-801. H) Canonical scores plots based on discriminant analyses for control (i.e. C1, C2, CMOS, CCRISPR), KSMOS and KSMOS treated with MK-801 (84% correct classification). Discriminant functions are based on using the following network activity parameters: firing rate, network burst rate, network burst duration, percentage of spike outside network burst and coefficient of variability of the inter-burst interval. Group envelopes (ellipses) are centered on the group centroids, n=50 for controls; n=6 for KSMOS and KSMOS treated with MK-801. Pie charts visualize accuracy of discriminant analyses functions by showing the relative distribution of lines per a-priory group after reverse testing for group identity. Data represent means ± SEM. * P<0.05, *** P<0.0005, **** P<0.0001, one-way ANOVA test and post hoc Bonferroni correction was performed between conditions. In this study, we developed a human model of KS that enabled us to identify specific functional aberrations, from gene expression to neuronal network behavior, due to EHMT1 haploinsufficiency. We found that excitatory networks derived from KS patients showed a distinct and robust neuronal network phenotype with striking similarity across different types of mutations in EHMT1. The phenotype was characterized by network bursts with a longer duration, lower frequency and more irregular pattern compared to controls. At the cellular level, we demonstrated that the network phenotype was mediated by upregulation of NR1. Interestingly, the neuronal phenotype was consistent across species and model systems. Indeed, we found that network bursts also occurred with a lower frequency, longer duration and irregular pattern in dissociated neuronal networks from either embryonic rats (i.e. where Ehmt1 was downregulated through RNA interference29). This indicates that some network parameters are consistently and similarly altered in divergent KS models. The appearance of a consistent phenotype both in a system where excitatory and inhibitory transmission were present and in a system where inhibition was absent (human iNeurons) indicates a major contribution from aberrant excitatory neurotransmission to KS pathobiology. One of the major characteristics of KS networks was the longer duration of the network bursts compared to controls. A change in burst length can be indicative of synaptic changes in GABARs, NMDARs and/or AMPARs31. Given that inhibition was absent in our human model, we focused our analysis on NMDARs and AMPARs. We present several lines of evidence that suggest the long bursts exhibited by KS networks are mediated by the upregulation of NR1, the mandatory subunit for functional NMDARs. First, by acutely blocking AMPA and NMDA receptors with chemical inhibitors, we show that network burst activity in KS networks is strongly dependent on NMDAR-mediated transmission, in contrast to control networks, where network bursts are mainly dependent on AMPAR-mediated transmission. Second, we were able to reverse KS network phenotypes, including the long network burst duration, by blocking NMDAR activity in mature networks. Third, we found that NR1 is upregulated in KS iNeurons at both the mRNA and protein level. Fourth, NR1 upregulation is paralleled by H3K9me2 hypomethylation, an epigenetic modification caused by EHMT1 deficiency, at the GRIN1 promoter. Finally, we found increased NMDAR-mediated currents in the cortex of Ehmt1+/− mice, a mouse model for KS. This cross-species comparison further validates that the effects we observed are due to decreased EHMT1 enzymatic function and show that the development of network activity in human and mouse cortical networks may follow evolutionarily conserved and stable epigenetic programming. Genetic evidence has directly implicated NMDARs directly in NDDs. For example, multiple heterozygous mutations in NMDAR subunit genes have been identified to be as causal for ID, ASD or epilepsy37. More indirectly, NMDAR dysfunction has been observed in humans and rodent models of ID/ASD. Although in most cases NMDAR dysfunction is attributed to hypofunction, there are several observations associating NMDAR hyperfunction to ID/ASD38. For example, upregulated NR1 protein levels were found in the cerebellum of ASD patients39. Furthermore, the NR2A and NR2B subunits of the NMDA receptor are upregulated in the valproic acid (VPA) animal model of autism40. In the Rett syndrome mouse model41, loss of MECP2 function resulted in developmental dysregulation of NMDAR expression35,42. Of note, work in mouse models identified temporal and spatial changes in NMDARs, illustrating the importance of age and brain regions in evaluating NMDAR expression in different genotypes43,44. Our data showing that NR1 is upregulated in KS iNeurons of cortical identity is the first to present NMDAR hyperfunction in excitatory neurons derived from patients with ID/ASD and supports the notion that glutamatergic neurotransmission can be dysfunctional in some NDDs. By blocking NMDARs in KS networks, we were able to induce synaptic plasticity (i.e the early phase of synaptic upscaling) that enabled, first, the incorporation of GluA2-lacking receptors, followed by the insertion of GluA2-containing receptors. Interestingly, this plasticity mediated by AMPARs was more easily initiated in KS than in control networks and allowed KS networks to switch, at least temporarily, from a mainly NMDAR-driven network to an AMPAR-driven network. These results suggest that loss of EHMT1 could facilitate NMDAR-mediated plasticity after a comparatively milder stimulus, in this case NMDAR blockade with D-AP5. This is in agreement with a recent study showing that inhibition of EHMT1/EHMT2 activity reinforces early-LTP in an NMDAR-dependent manner18. The authors showed that pharmacologically blocking EHMT1/2 before a mild LTP stimulus increased the LTP response, highlighting a role for EHMT1 and associated H3K9me2 in metaplasticity18. A link between NMDARs and EHMT1 has also been shown in vivo where NMDAR activity regulates the recruitment of EHMT1/2 and subsequent H3K9me2 levels at target gene promoters in the lateral amygdala, in the context of fear learning45. This, together with our data, suggests that there is a reciprocal interaction, between NMDAR activity and EHMT1 function, and a positive feedback mechanism where EHMT1 methylates the NR1 promoter upon activation by NMDARs. If and under which circumstances such a feedback mechanism is active during development and/or in adulthood deserves further investigation. At the molecular level we show that the upregulation of NR1 correlates with reduced H3K9me2 occupancy at the GRIN1 promoter. This suggests that during normal development EHMT1 is directly involved in the regulation of NR1 expression through H3K9me2 deposition at the GRIN1 promoter. However, we cannot exclude that EHMT1 also regulates NR1 expression via other, less direct mechanisms. For example, EHMT1 is a member of a large complex that includes the Neuron-Restrictive Silencer Factor (NRSF/REST) repressive unit, which is important for repressing neuronal genes in progenitors, including NR146–48. In addition, growth factors such as BDNF, which is increased upon EHMT1 deletion16, have been shown to increase NR1 mRNA levels in cultured embryonic cortical neurons49. An important aspect of our study is the identification of a robust and consistent network phenotype linked to KS and measured with MEAs. We show that KS networks differed from controls based on a set of parameters describing the neuronal network activity and using discriminant analysis. Our analysis showed that individual unrelated controls clustered with little variation, which was exemplified by the fact our predictive group membership analysis was able to accurately assign control networks to the control group (Fig. S6). In contrast, we found that KS patient lines significantly differed from controls, including their respective isogenic controls (CMOS vs KMOS and CCRISPR vs KSCRISPR). In addition, when we performed predictive group membership analysis, we found that individual KS networks were mostly assigned to the corresponding patient line (Fig. S6), indicating that this level of analysis on neuronal networks can potentially detect patient-specific phenotypic variance that arises early in development. It is foreseeable that, in future studies, an in depth interrogation of the network activity networks, consisting of different human derived cell types (inhibitory, astrocytes, microglia,…) or networks from brain organoids would allow measuring more complex neuronal signals on MEAs. This would be especially relevant for the stratification of genetically complex disorders (e.g., idiopathic forms of ASD) as these in vitro network phenotypes could then be used as an endophenotype in pharmacological studies. We show it is possible to rescue the neuronal phenotype by blocking NMDA receptors in mature networks, a finding that has important clinical relevance. For example, NMDAR antagonists, such as ketamine and memantine, have been used successfully as treatment strategies in mouse models of RTT and have led to improvements in small open-label trials for autism50–52. These studies, as well as ours, provide preclinical proof of concept that NMDAR antagonists could ameliorate neurological dysfunction and reverse at least some circuit-level defects. Furthermore, our observation that neuronal phenotypes can be rescued in mature networks agrees with previous data showing that reinstating EHMT1 function in adult flies is sufficient to rescue memory deficits13. This adds to a growing list of genetically defined ID syndromes that might be amenable to postnatal therapeutic intervention53. In summary, our study shows that combining iPS cell-derived human neuronal models with neuronal network dynamics is a promising tool to identify novel targets that inform us about possible treatment strategies for NDDs such as ID and ASD. In this study we used in total four control and four iPS cells with reduced EHMT1 function. In contrast to a previous study54 we included patients in this study that present the full spectrum of KS associated symptoms, including ID and ASD. KS1 and KS2 originate from two individuals: a female KS patient with a frameshift and a missense mutation in the EHMT1 gene, respectively (patient 25 in22 and patient 20 in8). An isogenic pair of control (CMOS) and KS line (KSMOS) originated from an individual diagnosed with a mosaic heterozygous 233 kbp deletion of chromosome 9 which includes the EHMT1 gene (deletion starts after exon 4)23. Clones were selected after performing RT-qPCR on genomic DNA with primers spanning Exon 3: F-GAAGCAAAACCACGTCACTG; R-GT AGTCCTCAAGGGCTGTGC. Exon 4: F-CCCAGAGAAGTTCGAGAAGC, R-GGGTAAAAGCTGCTGTCGTC. Exon 5 F-CAGCTGCAGTATCTCGGAAG, R-AACATCTCAATCACCGTCCTC. Exon 6 F-GACTCGGATGAGGACGACTC, R-GGAAGTCCTGCTGTCCTCTG. All iPS cells used in this study were obtained from reprogrammed fibroblasts. For most of the lines reprogramming to iPS cells was induced by retroviral vectors expressing four transcription factors: Oct4, Sox2, Klf4, and cMyc. For control line (C2), which was obtained from55 Mandegar et al., episomal reprogramming was performed, whereas the CCRISPR line was generated by non-integrating Sendai virus. Generated clones (at least two per patient line) were selected and tested for pluripotency and genomic integrity based on single nucleotide polymorphism (SNP) arrays. IPS cells were always cultured on Matrigel (Corning, #356237) in E8 flex (Thermo Fisher Scientific) supplemented with primocin (0.1 μg/ml, Invivogen) and low puromycin (0.5 μg/ml) and G418 concentrations (50 μg/ml) at 37°C/5% CO2. Medium was refreshed every 2-3 days and cells were passaged twice per week using an enzyme-free reagent (ReLeSR, Stem Cell Technologies). We made use of the CRISPR/Cas9 technology in order to create a heterozygous EHMT1 mutation in Exon 2 in a iPS cell line derived from a healthy 51 year-old male to mimic KS in isogenic cell lines, generated by KULSTEM (Leuven, Belgium). In brief, 1×106 iPSCs in single-cell suspension were nucleofected with Cas9 ribonucleoprotein complexes (10 μg/reaction S.p. Cas9 Nuclease 3NLS (IDT 1074181), CRIPSPR crRNAs (IDT) and CRISPR tracrRNA (IDT 1072532) 0.4 nmoles each/reaction) and a donor vector (5 μg/ reaction). The two crRNAs were designed to specifically target EHMT1 (TCTAACAGGCAGTTCCGGCGAGG and TAACAGGCAGTTCCGGCGAGGGG). The donor vector was a piggyback construct containing a hygromycin selection cassette as well as sequences that enable homology-directed repair ensuring the insertion of premature stop codons in Exon 2 of the EHMT1 gene. Cells were nucleofected using the Human Stem Cell Nucleofector® Kit 2 (Lonza, VPH-5022) in combination with the AMAXA-2b nucleofector, program F16. After nucleofection cells were resuspended in E8 flex (Thermo Fisher Scientific) supplemented with Revitacell (Thermo Fisher Scientific). When the iPS cells reached a confluency of about 40% selection was started using 5 μg/ml hygromycin. The antibiotics concentration was increased to up to 200 μg/ml over 2 weeks. Hygromycin resistant colonies were picked and PCR validation was used to ensure heterozygous editing of Exon2. To prove reduced EHMT1 expression in the CRISPR/Cas9 edited clone RT-qPCR and Western Blot were performed to measure EHMT1 protein levels in CCrispr and KSCrispr. DNA fingerprinting profile was performed on both lines by qPCR detection of a reference set of SNP panel using the TaqMan assays from Life Technologies. The genome-edited iPS cell line shows identical SNP profile with the corresponding iPS cell line used for gene targeting. Off-target of genome editing was verified by sequencing the top four off-target sites of each gRNA have been sequenced and no INDELs were detected (Supplementary Fig. S5). The generated iPS cells were validated for pluripotency markers and quantitative analysis of tri-lineage differentiation potential was performed. All generated iPS cell lines have the capacity to differentiate towards all three germ layers (endoderm, mesoderm, ectoderm). To this end embryoid bodies were generated in 24-well Corning low attachment plates. For spontaneous differentiation, the culture was kept for 7 days in E6 medium (Thermo Fisher Scientific). The medium was changed every 2 days. Cells were harvested after 7 days for RNA extraction with the GenElute Mammalian Total RNA kit (Sigma). cDNA synthesis was performed with Superscript III and used for qPCR according to manufacturer’s protocol with TaqMan human iPS cell Scorecard assay (Life Technologies). Data analysis was performed with Scorecard software (online tool Life technologies), comparing with a reference set of pluripotent stem cell lines. For Western Blot cell lysates were made from confluent wells in 6-well plates of either iPS cells or iNeurons. Medium was always refreshed 4 hours beforehand. Protein samples were loaded, separated by SDS-PAGE, and transferred to nitrocellulose membrane (BIO-RAD). The membrane was then probed with an EHMT1 antibody (Abcam, ab41969) or NMDAR1 (Biolegend, 818601). To control for loading differences we probed with anti-gamma tubulin (Sigma, T5326) or GAPDH (Cell Signaling, #2118). For visualization horseradish peroxidase-conjugated secondary antibodies were used (goat anti-mouse: Jackson ImmunoResearch Laboratries, 115-035-062. Goat-anti rabbit: Invitrogen, A21245). iPS cells were directly derived into, excitatory cortical Layer 2/3 neurons by overexpressing the neuronal determinant Neurogenin 2 (NGN2) upon doxycycline treatment based on Zhang et al.24 and as we described previously25. To support neuronal maturation, freshly prepared rat astrocytes25 were added to the culture in a 1:1 ratio two days after plating. At days in vitro (DIV) 3 the medium was changed to Neurobasal medium (Thermo Fisher Scientific) supplemented with B-27 (Thermo Fisher Scientific), glutaMAX (Thermo Fisher Scientific), primocin (0.1 μg/ml), NT3 (10 ng/ml), BDNF (10 ng/ml), and doxycycline (4μg/ml). Cytosine b-D-arabinofuranoside (Ara-C) (2μM; Sigma) was added once to remove any proliferating cell from the culture. From DIV 6 onwards half of the medium was refreshed three times a week. The medium was additionally supplemented with 2,5% FBS (Sigma) to support astrocyte viability from DIV 10 onwards. Neuronal cultures were kept through the whole differentiation process at 37°C/5%CO2. Primary cortical neurons were prepared from Ehmt1+/− and Ehmt1+/+ mice from individual E16.5 embryos as previously described16. Since the genotype was unknown at the time of harvest, each embryo was collected and the brains were processed separately. Each whole brain was kept on ice in 1 mL L-15 medium, organized separately in a 24-well plate, and tail clips were collected for genotyping. To examine morphology of neurons cells on coverslips were transfected with plasmids expressing Discosoma species red (dsRED) fluorescent protein one week after plating. DNAin (MTI-GlobalStem) was used according to manual instructions. Medium was refreshed completely the day after DNAin application. After the treatment cells were cultured as previously described. After three weeks of differentiation cells were fixed in 4% paraformaldehyde/ 4% sucrose (v/v) in PBS and mounted with DAKO. Transfected neurons were imaged using a Zeiss Axio Imager Z1 and digitally reconstructed using Neurolucida 360 software (MBF–Bioscience, Williston, ND, USA). For large cells multiple 2-dimensional images of these neurons were taken and subsequently stitched together using the stitching plugin of FIJI 2017 software. The 3-dimensional reconstructions and quantitative morphometrical analyses focused on the somatodenritic organization of the neurons. We defined origins for individual primary dendrites by identifying emerging neurites with diameters that were less than 50% of the diameter of the soma. Axons, which were excluded from reconstructions and further analysis, we visually identified by their long, thin properties, far reaching projections and numerous directional changes Neurons that had at least two primary dendrites and reached at least the second branching order were considered for analysis. For morphometrical analysis we determined soma size, number of primary dendrites, length and branching points per primary dendrite and total dendritic length. To measure the total span of the dendritic field (receptive area) of a neuron we performed convex hull 3D analysis. Note, that due to the 2-dimensional nature of the imaging data, we collapsed the convex hull 3D data to 2-dimensions, resulting in a measurement of the receptive area and not the volume of the span of the dendritic field. Furthermore, Sholl analysis was performed to investigate dendritic complexity in dependence form distance to soma. For each distance interval (10 μm each) the number of intersections (the number of dendrites that cross each concentric circle), number of nodes and total dendritic length was measured. Discriminant function analysis with canonical discriminant functions and reclassification of group membership based on parameters describing neuronal morphology were performed in SPSS. Cells were fixed with 4% paraformaldehyde/ 4% sucrose (v/v) for 15 minutes and permeabilized with 0.2% triton in PBS for 10 minutes at RT. Non-specific binding sites were blocked by incubation in blocking buffer (PBS, 5% normal goat serum, 1% bovine serum albumin, 0.2% Triton) for 1 hour at RT. Primary antibodies were diluted in blocking buffer incubated overnight at 4°C. Secondary antibodies, conjugated to Alexa-fluorochromes, were also diluted in blocking buffer and applied for one hour at RT. Hoechst 33342 (Molecular Probes) was used to stain the nucleus before cells were mounted using DAKO fluorescent mounting medium (DAKO). Neurons were fixed at DIV 21 for synaptic stainings. Used primary antibodies were: mouse anti-MAP2 (1:1000; Sigma M4403); guinea pig anti-MAP2 (1:1000; Synaptic Systems 188004); guinea pig anti-synapsin 1/2 (1:1000; Synaptic Systems 106004); mouse anti-PSD95 (1:50; Thermo Fisher Scientific MA1-045); rabbit anti-GFAP (1:500; Abcam ab7260), mouse anti-pan axon (1:1000; Covance SMI-312R). Secondary antibodies that were used are: goat anti-guinea pig Alexa Fluor 647 (1:2000, Invitrogen A-21450); goat anti-rabbit Alexa Fluor 488 (1:2000, Invitrogen A-11034); goat anti-rabbit Alexa Fluor 568 (1:2000, Invitrogen A-11036); goat anti-mouse Alexa Fluor 488 (1:2000, Invitrogen A-11029); goat anti-mouse Alexa Fluor 568 (1:2000, Invitrogen A-11031). We imaged at a 63x magnification using the Zeiss Axio Imager Z1 equipped with apotome. All conditions within a batch were acquired with the same settings in order to compare signal intensities between different experimental conditions. Signals were quantified using FIJI software. The number of synaptic puncta was determined per individual cell via manual counting and divided by the dendritic length of the neuron. To investigate H3K9me2 iNeurons were fixed at DIV3. Used primary antibodies are: rabbit anti-H3K9me2 antibody (1:500, Millipore 07-441), and guinea pig anti-MAP2 antibody (1:1000, Synaptic Systems 188004). Secondary antibodies used are: goat anti-rabbit Alexa Fluor 488 (1:2000, Invitrogen A-11034) and goat anti-guinea pig Alexa Fluor 647 (1:2000, Invitrogen A-21450). Epifluorescent images were taken with the same exposure time using Zeiss Axio Imager Z1 with apotome. H3K9me2 was assessed based on color intensity measurements by ImageJ analysis tools. RNA samples were isolated from both, iPS cells or iNeurons (DIV28) using Nucleo Spin RNA isolation kit (Machery Nagel, 740955.250) according to the manufacturer’s instructions. RNA samples (200 ng) were converted into cDNA by iScript cDNA synthesis kit (BIO-RAD, 1708891). cDNA products were cleaned up using the Nucleospin Gel and PCR clean-up kit (Machery Nagel, 740609.250). Human-specific primers were designed with Primer3plus (http://www.bioinformatics.nl/cgi-bin/primer3plus/primer3plus.cgi) and IDT PrimerQuest (https://eu.idtdna.com) tools, respectively. Primer sequences are given in supplementary Table S1. qPCRs were performed in the 7500 Fast Real Time PCR System apparatus (Applied Biosystems) with GoTaq qPCR master mix 2X with SYBR Green (Promega, A600A) according to the manufacturer’s protocol. The PCR program was designed as following: After an initial denaturation step at 95°C for 10 min, PCR amplifications proceeded for 40 cycles of 95°C for 15 s and 60°C for 30 s and followed by a melting curve. All samples were analyzed in duplicate in the same run, placed in adjacent wells. Reverse transcriptase-negative controls and no template-controls were included in all runs. The arithmetic mean of the Ct values of the technical replicas was used for calculations. Relative mRNA expression levels were calculated using the 2^-ΔΔCt method56 with standardization to housekeeping genes. ChIP was performed according to the Blueprint-IHEC (international human epigenome consortium) protocol with slight modifications. Briefly, 500.000 cells were used for one immunoprecipitation reaction. Cells were first crosslinked with disuccinimidyl glutarate (DSG) at a final concentration of 2 mM for 30 min at RT followed by second crosslinking treatment with 1% formaldehyde for 8 min at RT. Crosslinking was stopped by adding glycine to a final concentration of 0.125 M for 10 min. Samples were washed and homogenized in cold lysis buffer (10 mM Tris (pH 8.0), 0.2%NP40, 0.2% TritonX-100, 1 mM EDTA, 0.5 mM EGTA, 5X protease inhibitors EDTA-free, and 10 mM NaCl) for 15 minutes on ice. Nuclei were lysed with Nuclei Lysis Buffer (1mM EDTA, 0.5 mM EGTA, 50 mM HEPES) for 20 min rotating at 4°C. After centrifugation the collected extracts were resuspended in sonication buffer (20 mM HEPES pH=7.6, 1% SDS, 2.5X protease inhibitors EDTA-free) and sonicated with Bioruptor Power-up (Diagenode) to shear DNA into 150-700 bp fragments. Cleaned-up chromatin was diluted with ChIP dilution buffer (0.15% SDS, 1% TritonX-100, 1.2 mM EDTA, 16.7 mM Tris pH=8, 167 mM NaCl. Immunoprecipitation was performed with anti-H3K9me2 (5 μg/reaction, Abcam ab1220) and anti-EHMT1 (15μg/reaction, Abcam ab41969) antibodies overnight rotating at 4°C. As a negative control, anti-human IgG (10 μg/reaction, Abcam ab2410) was used in place of specific antibodies. Chromatin was enriched by 10 μL of each Protein A (Invitrogen, 10001D) and Protein G Dynabeads (Invitrogen, 10003D) for 2 hrs rotating at 4°C. Beads were washed once with Wash Buffer 1 (2mM EDTA, 20 mM Tris pH=8, 1% TritonX-100, 0.1% SDS, 150 mM NaCl), twice with Wash Buffer 2 (2mM EDTA, 20 mM Tris pH=8, 1% TritonX-100, 0.1% SDS, 500 mM NaCl), twice with Wash Buffer 3 (1mM EDTA, 10 mM Tris pH=8) and eluted in elution buffer (1% SDS; 100 mM NaHCO3) by rotating for 20 minutes at RT. Eluate was de-crosslinked in elution buffer with 40 μg proteinase-K and 200 mM NaCl overnight at 65°C. DNA material was cleaned with QIAquick MinElute PCR Purification Kit (Qiagen, 28006) according to manufacturer’s instructions. 5 μL of eluted DNA sample was used for qPCR analysis. qPCRs were performed as described earlier. For primer sequences see Supplementary Table S2. All samples were analyzed in duplicate in the same run and placed in adjacent wells. ChIP-qPCR results are expressed as % input, which was calculated by the following formula: 100*2−ΔCt, where ΔCt= Ct[ChIP] - (Ct[input]-Log2(input dilution factor)). All recordings were performed using the 24-well MEA system (Multichannel Systems, MCS GmbH, Reutlingen, Germany). MEA devices are composed by 24 independent wells with embedded micro-electrodes (i.e. 12 electrodes/well, 80 μm in diameter and spaced 300 μm apart). Spontaneous electrophysiological activity of iPS cell-derived neuronal network grown on MEAs was recorded for 20 min. During the recording, the temperature was maintained constant at 37°C, and the evaporation and pH changes of the medium was prevented by inflating a constant, slow flow of humidified gas (5% CO2 and 95% O2) onto the MEA plate (with lid on). The signal was sampled at 10 KHz, filtered with a high-pass filter (i.e. Butterworth, 100 Hz cutoff frequency) and the noise threshold was set at ± 4.5 standard deviations. Data analysis was performed off-line by using Multiwell Analyzer (i.e. software from the 24-well MEA system that allows the extraction of the spike trains) and a custom software package named SPYCODE developed in MATLAB (The Mathworks, Natick, MA, USA) that allows the extraction of parameters describing the network activity57. The mean firing rate (MFR) of the network was obtained by computing the firing rate of each channel averaged among all the active electrodes of the MEA. Burst detection. Bursts were detected using a Burst Detection algorithm. The algorithm is based on the computation of the logarithmic inter-spike interval histogram in which inter-burst activity (i.e., between bursts and/or outside bursts) and intra-burst activity (i.e., within burst) for each recording channel can be easily identified, and then a threshold for detecting spikes belonging to the same burst is automatically defined. From the burst detection, the number of bursting channels (above threshold 0.4 burst/sec and at least 5 spikes in burst with a minimal inter-spike-interval of 100 milliseconds) was determined. Network burst detection. Synchronous events were detected by looking for sequences of closely-spaced single-channels bursts. A network burst was defined as burst that occurs in >80% of the network active channels. The distributions of Network Burst Duration (NBD, s) and Network Inter-Burst Interval (NIBI, interval between two consecutive network burst, s) were computed using bins of 100 ms and 1 s respectively. Network burst irregularity. Irregularity was estimated by computing the coefficient of variation (CV) of the network inter-burst intervals (NIBI), which is the standard deviation divided by the mean of the NIBI. Discriminant function analysis with canonical discriminant functions and reclassification of group membership based on parameters describing neuronal network activity were performed in SPSS. All reagents were prepared fresh into concentrated stocks as indicated below, and stored frozen at −20°C. The following compounds were used in pharmacological experiments: 1-Naphthyl acetyl spermine trihydrochloride (“Naspm”, 100 mM in PBS, Tocris Cat No 2766); (+)-MK 801 maleate (“MK-801”, 100 mM in DMSO, Tocris Cat No 0924); 2,3-Dioxo-6-nitro-1,2,3,4-tetrahydrobenzo[f]quinoxaline-7-sulfonamide (“NBQX”, 100 mM in DMSO, Tocris Cat No 0373); D-2-amino-5-phosphonovalerate (“D-AP5”, 50 mM in PBS, Tocris Cat No 0106); Retigabine (100 mM in DMSO, Tocris Cat No 6233). For all experiments on MEAs, and immediately before adding a compound to the cells, an aliquot of the concentrated stock was first diluted 1:10 in room temperature DPBS and vortexed briefly. Then, the appropriate amount of working dilution was added directly to wells on the MEA and mixing was primarily through diffusion into the (500 μl) cell culture medium. Of note, where relevant the DMSO concentration in the medium was always ≤0.05% v/v. Control and KS patient neuronal networks were treated acutely with D-AP5 (60 μM), NBQX (50 μM), MK-801 (1 μM), Naspm (10 μM) or Retigabine (10 μM) at DIV 28 after a 20-min recording of spontaneous activity. Then, the recording was paused, the compounds were added to the MEA, and the recording was re-started after 5 min. We recorded neuronal network activity for 60 min with D-AP5 or NBQX, 90 min with MK-801, 100 min with Retigabine, and for 20 min after the addition of Naspm. In experiments where we examined the effect of chronic NMDA receptor blockade, control and KS patient neuronal networks were treated with 1 μM MK-801 starting at DIV 28 and lasting 7 days total. MK-801 was replenished every two days, where it was freshly diluted to 1 μM in complete Neurobasal medium for the routine half-medium change. All experiments were performed at 37°C. For single cell recordings we used neurons derived from C1, C2, CMOS and KS1, KS2 and KSMOS after three weeks of differentiation. Experiments were performed in a recording chamber on the stage of an Olympus BX51WI upright microscope (Olympus Life Science, PA, USA) equipped with infrared differential interference contrast optics, an Olympus LUMPlanFL N 40x water-immersion objective (Olympus Life Science, PA, USA) and kappa MXC 200 camera system (Kappa optronics GmbH, Gleichen, Germany) for visualisation. Recordings were made using a SEC-05X amplifier (NPI Electronic GmbH, Tamm, Germany), low-pass filtered at 3 kHz and digitized at 10kHz using a 1401 acquisition board and recorded with Signal (CED, Cambridge, UK). Recordings were not corrected for liquid junction potential (± 10 mV). We performed the recordings of neurons cultured on cover slips under continuous perfusion with oxygenated (95% O2/5% CO2) artificial cerebrospinal fluid (ACSF) at 30°C containing (in mM) 124 NaCl, 1.25 NaH2PO4, 3 KCl, 26 NaHCO3, 11 Glucose, 2 CaCl2, 1 MgCl2 (adjusted to pH 7.4). Patch pipettes (6-8 MΩ) were pulled from borosilicate glass with filament and fire-polished ends (Science Products GmbH, Hofheim, Germany) using the PMP-102 micropipette puller (MicroData Instrument, NJ, USA). For current clamp recordings of the intrinsic electrophysiological properties, we filled pipettes with a potassium-based solution containing 130 mM K-Gluconate, 5 mM KCl, 10 mM HEPES, 2.5 mM MgCl2, 4 mM Na2-ATP, 0.4 mM Na3-ATP, 10 mM Na-phosphocreatine, 0.6 mM EGTA (adjusted to pH 7.25 and osmolarity 290 mosmol). We determined the resting membrane potential (Vrmp) after achieving whole-cell configuration and only considered neurons with Vrmp of −55 mV and lower for further testing and analyses. Recordings were not corrected for liquid junction potentials of ca. −10 mV. All further electrophysiological characterizations we performed at a holding potential of −60 mV. We determined the passive membrane properties via a 0.5 s hyperpolarizing current of −25 pA. Active intrinsic properties, i.e. action potential (AP) firing characteristics we derived from the first AP elicited by a 0.5 s depolarising current injection just sufficient to reach AP threshold. For voltage clamp recordings we filled pipettes with a cesium-based solution containing 115 mM cesium methanesulfonate, 20 mM CsCl, 10 mM HEPES, 2.5 mM MgCl2, 4 mM Na2ATP, 0.4 mM Na3GTP, 10 mM sodium phosphocreatine, and 0.6 mM EGTA adjusted to a pH of 7.4. Spontaneous action potential-evoked postsynaptic currents (sEPSC) were recorded in drug-free ACSF without. Miniature excitatory postsynaptic currents (mEPSC) were measured in voltage clamp at a holding potential of −60 mV in the presence of 1 μM tetrodotoxin (Tocris, Bristol, UK) and 100 μM picrotoxin (Tocris, Bristol, UK). Intrinsic electrophysiological properties were analysed using Signal and MatLab (MathWorks, MA, USA), while mEPSCs were analysed using MiniAnalysis 6.0.2 (Synaptosoft Inc, Decatur, GA, USA) as described earlier16. Discriminant function analysis with canonical discriminant functions and reclassification of group membership based on neuronal intrinsic properties were performed in SPSS. We used litter-matched Ehmt1+/− and Ehmt1+/+ mice of adolescent age (postnatal day 21-24). Acute slices were prepared as described earlier16. In brief, animals were deeply anesthetized with isoflurane, then quickly decapitated. 350-μm-thick coronal slices were cut using a microtome (HM650V, Thermo Scientific) in ice-cold “cutting and storage” ACSF containing 87 mM NaCl, 11 mM glucose, 75 mM sucrose, 2.5 mM KCl, 1.25mM NaH2PO4, 0.5 mM CaCl2, 7 mM MgCl2, and 26 mM NaHCO3, continuously oxygenated with 95% O2/5% CO2. Slices were incubated for 1 hr at 32°C, after which they were allowed to cool down to room temperature. The slices were then transferred to a recording setup as described above, and incubated in recording ACSF (124 mM NaCl, 10 mM glucose, 3 mM KCl, 1.25 mM NaH2PO4, 2 mM CaCl2, 1 mM MgCl2, and 26mM NaHCO3) at 30°C with added 100 mM Picrotoxin to block GABAergic transmission. A bipolar electrode (CE2C55, FHC) coupled to an SD9 stimulator (Grass Instruments, RI, USA) was inserted into layer 4 of the auditory cortex, and pyramidal cells were patched in layer 2/3 above the bipolar electrode (<200 μm lateral distance) using 3-6 MΩ borosilicate pipettes filled with a Cesium-based intracellular solution containing 115 mM CsMeSO3, 20 mM CsCl2, 10 mM HEPES, 2.5 mM MgCl2, 4 mM Na2ATP, 0.4 mM NaGTP, 10 mM Na-Phosphocreatine, 0.6 mM EGTA and 5 mM QX-314. The cells were held in voltage-Clamp mode controlled by an SEC 05-LX amplifier (NPI, Tamm, Germany), low-pass filtered at 3 kHz and sampled at 20 kHz with a Power-1401 acquisition board and Signal software (CED, Cambridge, UK). Data was analyzed in Clampfit 10.7 (Molecular Devices). The AMPA trace was measured at −70 mV holding potential; stimulus strength was adjusted to 50-100 pA postsynaptic response, and 60 sweeps were averaged for the final trace. NMDA was measured at +40 mV holding potential. Cells were discarded if the measured AMPA response contained multiple peaks, indicating multisynaptic input, or if the averaged amplitude was below 25 pA. AMPA amplitudes were quantified as the peak amplitude at −70 mV holding voltage, and the NMDA amplitudes were quantified as the average of 5 ms of the trace 55 ms after the stimulus artefact. For the animal experiments presented in this study, mice heterozygous for a targeted loss-of-function mutation in the Ehmt1 gene (Ehmt1+/− mice) and their WT littermates on C57BL/6 background were used, as previously described11. Animal experiments were conducted in conformity with the Animal Care Committee of the Radboud University Nijmegen Medical Centre, The Netherlands, and conform to the guidelines of the Dutch Council for Animal Care and the European Communities Council Directive 2010/63/EU. The statistical analysis for all experiments was performed using GraphPad Prism 5 (GraphPad Software, Inc., CA, USA). We ensured normal distribution using a Kolmogorov-Smirnov normality test. To determine statistical significance for the different experimental conditions p-values <0.05 were considered to be significant. Statistical analysis between lines were performed with two-ways ANOVA and Post-hoc Bonferroni correction. We analyzed significance between Control and Kleefstra groups by means of the Mann-Whitney-U-Test. Data are presented as Mean ± standard error of the mean (SE). Details about statistics are reported in Supplementary Table S3 (Excel file Statistics). This work was supported by grants from: the Netherlands Organization for Scientific Research, open ALW ALW2PJ/13082 (to H.v.B., N.N.K, H.Z. T.K. D.S); grant 012.200.001 (to N.N.K); the Netherlands Organization for Health Research and Development ZonMw grant 91718310 (to T. K.) and the Jerome Lejeune Foundation (to H.v.B). GGA is supported by a postdoctoral research grant from TÜBITAK (1059B191600426). M.F, H.v.B, D.S and N.N.K conceived and supervised the study. M.N performed all animal work. M.F, K.L, J.K and N.N.K designed all the experiments. M.F, K.L, J.K, G.G, B.M, J.v.R, K.F, N.K, A.O, W.v.d.A and C.S performed all experiments. H.v.B, T.K and H.Z provided resources. D.S, M.F, K.L, G.G, N.K, K.F, A.O, B.M, J.v.R, M.N performed data analysis. M.F, K.L, J.K and N.N.K wrote the manuscript. D.S, H.v.B, T.K and M.N edited the manuscript. We declare to have no competing interests. We thank dr. J. Ladewig for providing the NGN2 lentiviral construct. Geschwind, D. H. & Flint, J. Genetics and genomics of psychiatric disease. Science 349, 1489–1494 (2015). Kochinke, K. et al. Systematic Phenomics Analysis Deconvolutes Genes Mutated in Intellectual Disability into Biologically Coherent Modules. Am. J. Hum. Genet. 98, 149–164 (2016). Willsey, A. J. et al. The Psychiatric Cell Map Initiative: A Convergent Systems Biological Approach to Illuminating Key Molecular Pathways in Neuropsychiatric Disorders. Cell 174, 505–520 (2018). Kleefstra, T. et al. Loss-of-function mutations in euchromatin histone methyl transferase 1 (EHMT1) cause the 9q34 subtelomeric deletion syndrome. The American Journal of Human Genetics 79, 370–377 (2006). Kleefstra, T. et al. Further clinical and molecular delineation of the 9q subtelomeric deletion syndrome supports a major contribution of EHMT1 haploinsufficiency to the core phenotype. J Med Genet 46, 598–606 (2009). Vermeulen, K. et al. The Context of Symptom Measures: Interpretation and Clinical Diagnosis of Autism Spectrum Disorders in Intellectual Disabilities. J Am Acad Child Adolesc Psychiatry 56, 618–619 (2017). Tachibana, M. et al. Histone methyltransferases G9a and GLP form heteromeric complexes and are both crucial for methylation of euchromatin at H3-K9. Genes Dev 19, 815–826 (2005). Balemans, M. C. M. et al. Hippocampal dysfunction in the Euchromatin histone methyltransferase 1 heterozygous knockout mouse model for Kleefstra syndrome. Hum Mol Genet 22, 852–866 (2013). Schaefer, A. et al. Control of cognition and adaptive behavior by the GLP/G9a epigenetic suppressor complex. Neuron 64, 678–691 (2009). Kramer, J. M. et al. Epigenetic regulation of learning and memory by Drosophila EHMT/G9a. PLoS Biol. 9, e1000569 (2011). Balemans, M. C. M. et al. Reduced exploration, increased anxiety, and altered social behavior: Autistic-like features of euchromatin histone methyltransferase 1 heterozygous knockout mice. Behav Brain Res 208, 47–55 (2010). Balemans, M. C. M. et al. Reduced Euchromatin histone methyltransferase 1 causes developmental delay, hypotonia, and cranial abnormalities associated with increased bone gene expression in Kleefstra syndrome mice. Dev. Biol. 386, 395–407 (2014). Gupta-Agarwal, S. et al. G9a/GLP Histone Lysine Dimethyltransferase Complex Activity in the Hippocampus and the Entorhinal Cortex Is Required for Gene Activation and Silencing during Memory Consolidation. Journal of Neuroscience 32, 5440–5453 (2012). Sharma, M., Razali, N. B. & Sajikumar, S. Inhibition of G9a/GLP Complex Promotes Long-Term Potentiation and Synaptic Tagging/Capture in Hippocampal CA1 Pyramidal Neurons. Cerebral cortex (New York, NY: 1991) 27, 3161–3171 (2017). Willemsen, M. H. et al. Update on Kleefstra Syndrome. Mol Syndromol 2, 202–212 (2012). Willemsen, M. H. et al. Familial Kleefstra syndrome due to maternal somatic mosaicism for interstitial 9q34.3 microdeletions. Clin. Genet. 80, 31–38 (2011). Selten, M., van Bokhoven, H. & Nadif Kasri, N. Inhibitory control of the excitatory/inhibitory balance in psychiatric disorders. F1000Res 7, 23 (2018). Uhlhaas, P. J. & Singer, W. Neural Synchrony in Brain Disorders: Relevance for Cognitive Dysfunctions and Pathophysiology. Neuron 52, 155–168 (2006). Suresh, J. et al. Network burst activity in hippocampal neuronal cultures: the role of synaptic and intrinsic currents. J Neurophysiol 115, 3073–3089 (2016). Lee, H.-K. Ca-permeable AMPA receptors in homeostatic synaptic plasticity. Front Mol Neurosci 5, 17 (2012). Turrigiano, G. G., Leslie, K. R., Desai, N. S., Rutherford, L. C. & Nelson, S. B. Activity-dependent scaling of quantal amplitude in neocortical neurons. Nature 391, 892–896 (1998). Rundfeldt, C. The new anticonvulsant retigabine (D-23129) acts as an opener of K+ channels in neuronal cells. Eur. J. Pharmacol. 336, 243–249 (1997). 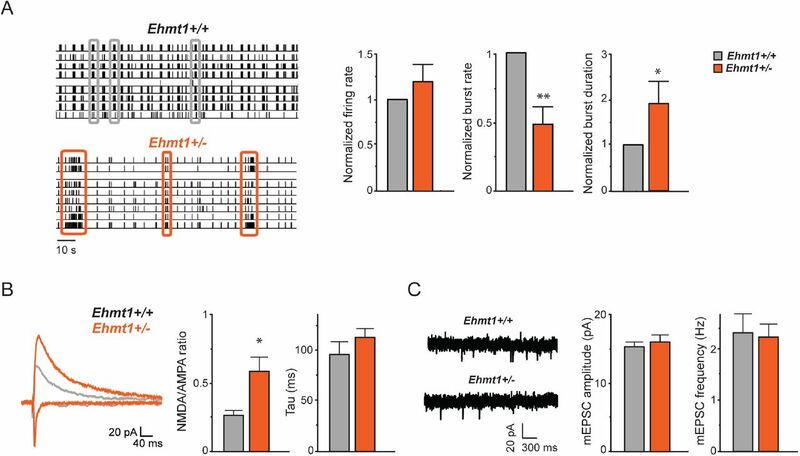 Mierau, S. B., Patrizi, A., Hensch, T. K. & Fagiolini, M. Cell-Specific Regulation of N-Methyl-D-Aspartate Receptor Maturation by Mecp2 in Cortical Circuits. Biol Psychiatry 79, 746–754 (2016). Song, X. et al. Mechanism of NMDA receptor channel block by MK-801 and memantine. Nature 556, 515–519 (2018). Rojas, D. C. The role of glutamate and its receptors in autism and the use of glutamate receptor antagonists in treatment. J Neural Transm 121, 891–905 (2014). Lee, E.-J., Choi, S. Y. & Kim, E. ScienceDirect NMDA receptor dysfunction in autism spectrum disorders. Curr Opin Pharmacol 20, 8–13 (2015). Purcell, A. E., Jeon, O. H., Zimmerman, A. W., Blue, M. E. & Pevsner, J. Postmortem brain abnormalities of the glutamate neurotransmitter system in autism. Neurology 57, 1618–1628 (2001). Rinaldi, T., Kulangara, K., Antoniello, K. & Markram, H. Elevated NMDA receptor levels and enhanced postsynaptic long-term potentiation induced by prenatal exposure to valproic acid. Proc Natl Acad Sci USA 104, 13501–13506 (2007). Guy, J., Hendrich, B., Holmes, M., Martin, J. E. & Bird, A. A mouse Mecp2-null mutation causes neurological symptoms that mimic Rett syndrome. Nat Genet 27, 322–326 (2001). Blue, M. E. et al. Temporal and regional alterations in NMDA receptor expression in Mecp2-null mice. Anat Rec (Hoboken) 294, 1624–1634 (2011). Gupta-Agarwal, S., Jarome, T. J., Fernandez, J. & Lubin, F. D. NMDA receptor-and ERK-dependent histone methylation changes in the lateral amygdala bidirectionally regulate fear memory formation. Learn. Mem. 21, 351–362 (2014). Bai, G., Zhuang, Z., Liu, A., Chai, Y. & Hoffman, P. W. The role of the RE1 element in activation of the NR1 promoter during neuronal differentiation. J Neurochem 86, 992–1005 (2003). Rodenas-Ruano, A., Chávez, A. E., Cossio, M. J., Castillo, P. E. & Zukin, R. S. REST-dependent epigenetic remodeling promotes the developmental switch in synaptic NMDA receptors. Nat Neurosci 15, 1382–1390 (2012). Mukherjee, S., Brulet, R., Zhang, L. & Hsieh, J. REST regulation of gene networks in adult neural stem cells. Nat Comms 7, 13360 (2016). Schratt, G. M., Nigh, E. A., Chen, W. G., Hu, L. & Greenberg, M. E. BDNF regulates the translation of a select group of mRNAs by a mammalian target of rapamycin-phosphatidylinositol 3-kinase-dependent pathway during neuronal development. J. Neurosci. 24, 7366–7377 (2004). Katz, D. M., Menniti, F. S. & Mather, R. J. N-Methyl-D-Aspartate Receptors, Ketamine, and Rett Syndrome: Something Special on the Road to Treatments? Biol Psychiatry 79, 710–712 (2016). Bello, O., Blair, K., Chapleau, C. & Larimore, J. L. Is memantine a potential therapeutic for Rett syndrome? Front Neurosci 7, 245 (2013). Joshi, G. et al. A Prospective Open-Label Trial of Memantine Hydrochloride for the Treatment of Social Deficits in Intellectually Capable Adults With Autism Spectrum Disorder. Journal of Clinical Psychopharmacology 36, 262–271 (2016). Bjornsson, H. T. et al. Histone deacetylase inhibition rescues structural and functional brain deficits in a mouse model of Kabuki syndrome. Sci Transl Med 6, 256ra135 (2014). Nagy, J. et al. Altered neurite morphology and cholinergic function of induced pluripotent stem cell-derived neurons from a patient with Kleefstra syndrome and autism. Transl Psychiatry 7, e1179 (2017). Mandegar, M. A. et al. CRISPR Interference Efficiently Induces Specific and Reversible Gene Silencing in Human iPSCs. Cell Stem Cell 18, 541–553 (2016). Bologna, L. L. et al. Investigating neuronal activity by SPYCODE multi-channel data analyzer. Neural Netw 23, 685–697 (2010).